SPSS RANK can be used to create a variable holding the rank numbers of the values of some other variable. RANK is also used for discretizing continuous variables into ntile groups. This tutorial walks you through the main options along with some real world examples. 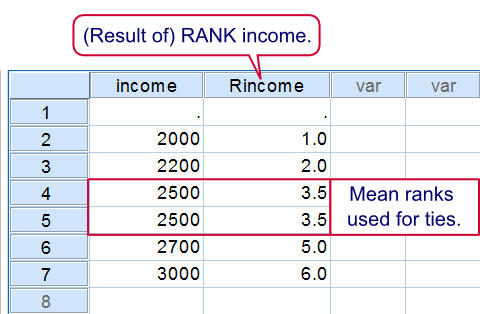 Running the syntax below first creates a mini dataset and then ranks income (the result is shown in the screenshot). The default name for the new variable is R + the old variable name, resulting in Rincome. Note that a system missing value does not get any rank number. A value occurring more than once is referred to as a tie. By default, mean rank numbers are assigned to ties. *2. Create variable with rank numbers for income. *3. Sort cases (ascendingly) on income. The following examples will all use employees.sav. The syntax below shows how to create four age groups of equal sizes by using RANK. (If the sample size is not divisible by the number of groups or ties are present, SPSS will attempt to make the group sizes as equal as possible.) In first instance the new variable is called Ndate_of where the N denotes Ntiles.SPSS uses a maximum of 8 letters for new variable names created by RANK. This is why we don't get Ndate_of_birth (as we may have expected). In step 4, we'll use MEANS for inspecting the result. *1. Set default directory and open data. *2. Create four age groups. rename variables ndate_of = age_group. Thus far we used RANK with regard to the entire sample. However, we may also RANK within groups defined by one or more variables. Like so, the syntax below creates median age groups within each gender separately. When these are combined with gender we'll get four groups indicating the 50% youngest women, the 50% oldest women and so on. Note that we undo all changes made to the data thus far by simply reopening it. *2. Create median age groups within gender. *3. Combine age groups with gender. compute gender_age_group = 2 * gender + ndate_of. *4. Sorting cases facilitates visual inspection. *5. Apply value labels to new variable. value labels gender_age_group 1 'Old woman' 2 'Young woman' 3 'Old man' 4 'Young man'. In the second example we used a basic RANK command and then used RENAME for changing the name of the new variable. Alternatively, we can specify a new variable name within RANK itself by using the INTO keyword as demonstrated by the syntax below. If you'd like to RANK multiple variables, you can do so in a single command. Like so, the final example below create median groups for date_of_birth, experience_years and monthly_income. *2. Create median groups for three variables at once. /ntiles(2) into dic_age dic_experience dic_income. If you paid close attention, you may have noticed something awkward in the previous example: for dic_experience and dic_income a higher value indicates more experience/income. However, for dic_age the reverse holds. This is because we used date_of_birth which is related inversely to age. One solution is to first compute raw age (also see How to Compute Age in SPSS?) and use that instead. However, an easier way out is to RANK (only) date_of_birth descendingly. Simply replacing RANK date_of_birth by RANK date_of_birth (D) in the last syntax does the trick here. Note that ranking into ntiles is quite similar to RECODE. However, with RANK the values that separate ntile groups depend on the data whereas with RECODE the group sizes depend on the data.